Matt Dillon, Tom Cruise, Ralph Macchio, Patrick Swayze. Rob Lowe, Emilio Estevez, C. Directed by Francis Ford Coppola. Poster artwork by David Grove. Artwork version - rare, specially in mint condition. Size: 27 x 41 inches (68.58 cm x 104.14 cm). Condition: near mint-mint and unused. 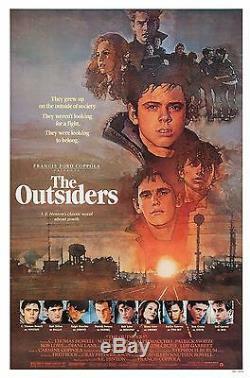 The item "THE OUTSIDERS (1983) ORIGINAL MOVIE POSTER ROLLED DAVID GROVE ARTWORK" is in sale since Wednesday, April 26, 2017. This item is in the category "Entertainment Memorabilia\Movie Memorabilia\Posters\Originals-United States\1980-89". The seller is "moviepostercenter" and is located in California. This item can be shipped worldwide.